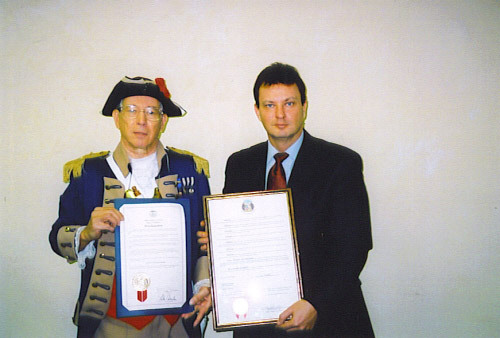 Major General Robert L. Grover, MOSSAR Color Gaurd Commander, is shown here with State Senator Victor E, Callahan, 11th Senatorial District on December 22, 2006 in Independence, MO. 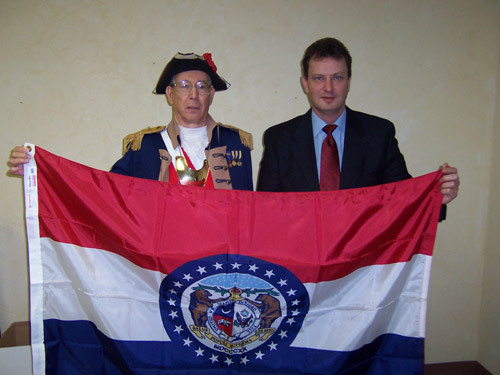 Senator Callahan provided the MOSSAR with two proclamations and the Missouri State Flag, which flew over the Capital of Missouri for the Missouri Society Sons of the American Revolution. NSSAR organization congressional charter signed on June 9, 1906. I, MICHAEL R. GIBBONS, President Pro Tem of the Senate, do hereby certify the above and foregoing to be a true and complete copy of the Senate Resolution offered by Senator Callahan and adopted on August 16, 2006, as fully as the same appears of record. IN TESTIMONY WHEREOF, I have hereunto set my hand and affixed the seal of the Senate of the State of Missouri this 16th day of August, A.D. 2006. Whereas, September 17, 2006 mark the two hundred nineteenth anniversary of the drafting of the Constitution of the United States of America by the Constitution Convention and: etc, etc. IN TESTIMONY WHEREOF, I have hereunto set my hand and caused to be affixed the Great Seal of the State of Missouri, in the City of Jefferson, this 13th day of September, 2006. Attest: Robin Carnahan, Secretary of State.